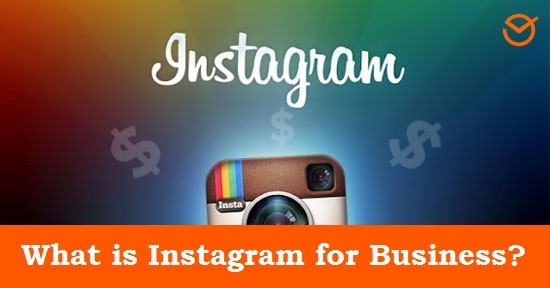 Utilize Instagram for Business to boost your company! As the famous saying goes, “First impressions last” and this truth applies on Social Networks as well. Images and videos are among the most shared content on Social Media, and that’s why today I’m showing you how to take advantage of Instagram for Business in order to reach your audience. 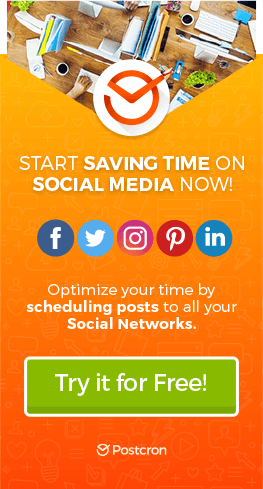 Why should you utilize Instagram for Business to promote your business? Instagram has two essential features which make it the ideal place to reach your audience. On one hand, the Social Network was acquired by Facebook, whose advertising service is one of the most extensive of our time, thus it’s features are extended to Instagram. 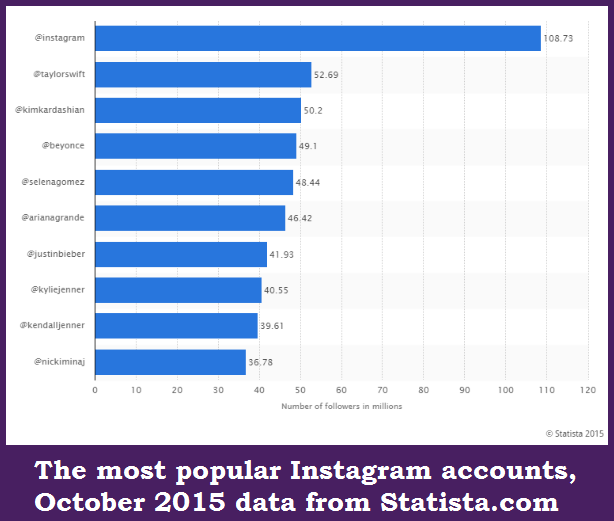 On the other hand, the types of content published on Instagram are the most shared on Social Media. According to statistics, videos and photos rank among the publications that people all over the world are interested in sharing. This means they’re very effective at attracting users! 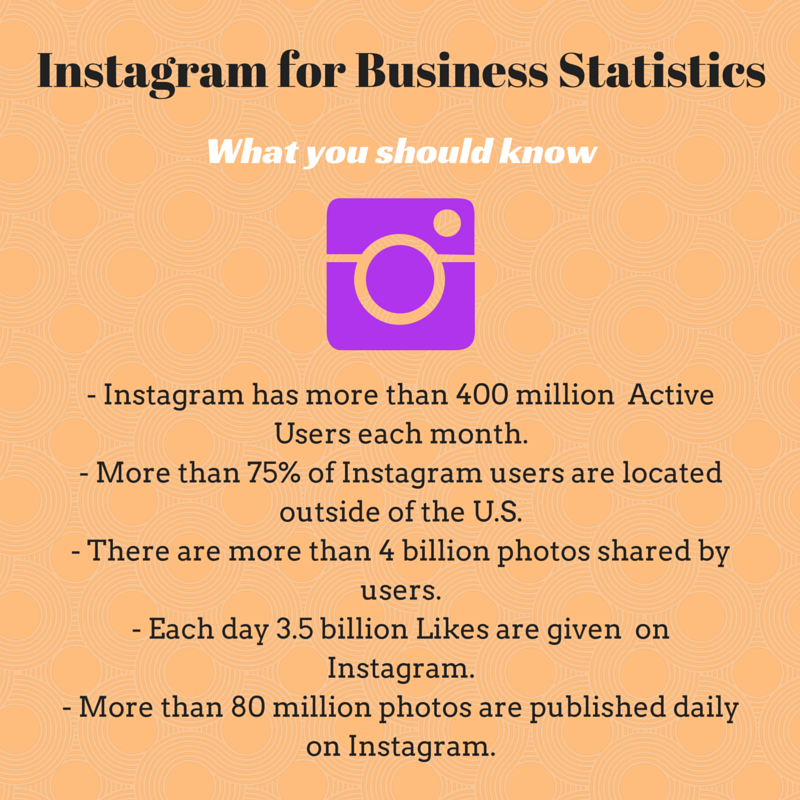 As you can see in the image, the number of Instagram users surpasses 400 million, and more than 75% of them are located outside of the United States. 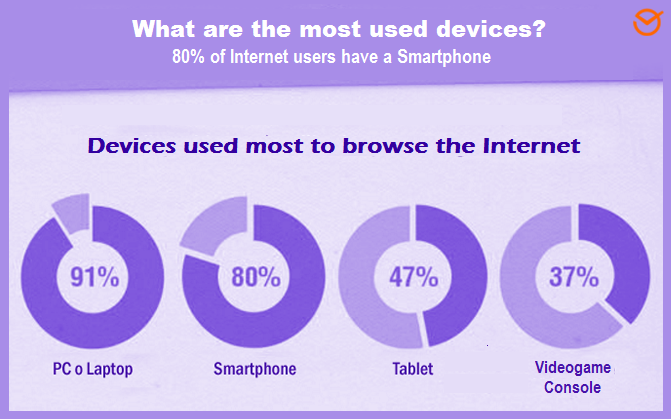 This means that your audience is most likely on this Social Network! Furthermore, everyday more than 80 million photos are published and more than 3.5 million Likes are given. Although there is a desktop version of Instagram (with less features of course), it’s the mobile app that is a real hit among users. Thus, Instagram is a fertile place to connect with your audience, being as 80% Internet traffic comes from Smartphones. 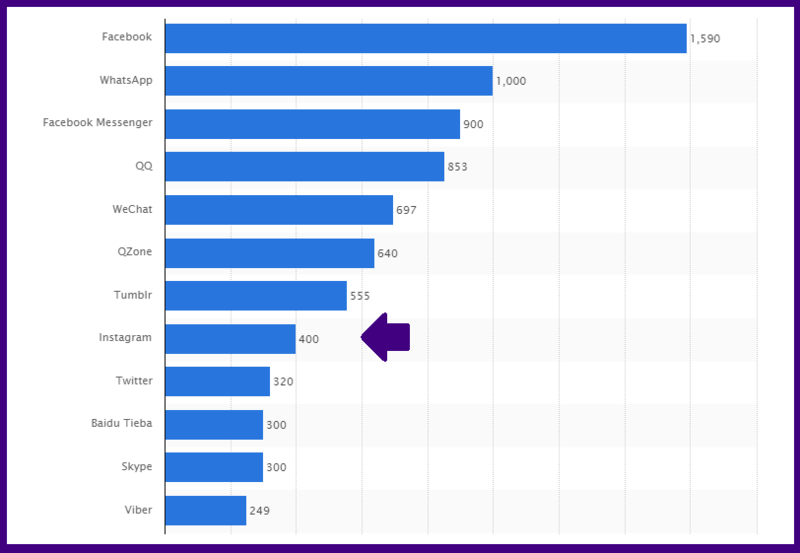 As you can see, Instagram is close to Twitter and Skype and continues its ascend upwards in the list led by the other two large Social Networks owned by Mark Zuckerberg and his mobile applications: Facebook, Whats app and Facebook Messenger. Finally, the interaction rate on Instagram (comments and “Likes”) is elevated, which indicates that their users are exposed to and involved in the content published there. So for example, according to statistics, 50% of comments are published within the first 6 hours of the publication being made. How can you use Instagram for Business to boost your business? Being as Instagram is a Social Network centered around images, you can transmit the spirit of your business to the public in a more human and close way. Additionally, it has informational benefits for photos and videos which are perfect for exhibiting your products, being creative and entertaining your audience. Features a huge Facebook database used for advertising purposes and boasts it’s incredible segmentation power for offering highly effective and personalized advertisements. Provides access to a predominately young and ever growing base of followers. Brands with more than 100K followers grew more than 163% in just two years. It uses Visual Storytelling, which can transmit a brand’s values like no other content in terms of effectiveness. It provides you the efficiency of placing hashtags, tags that if used well can put you in view of your audience daily. It gives you the possibility to accomplish different goals in your advertising campaigns. Instagram is a Social Network oriented towards mobile devices and every day it is more and more necessary to execute your mobile ads campaigns with success. In this regard, they offer you the best tools so that you can develop your Branding (brand building) and Performance goals. Promote the installation of your app. 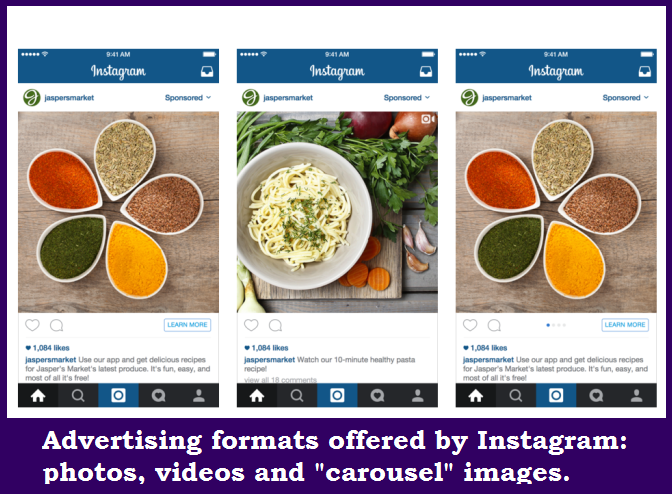 As you can see in the image above, the basic advertising formats on Instagram on Photo Ads, Video Ads and Carousel Ads. Photo Ads: Help brands to tell their story and present their proposals through attractive and beautiful images. This way you can encourage people in a more human, original and creative way in order to promote the execution of a specific action or to convey your brand’s values. Video Ads: Allow creating video advertisements with the same parameters for quality images as photography ads, but with moving and audio communicative benefits. This class of announcements may have a duration up to 30 seconds and should be created in landscape format. Carousel Ads: This focuses on the possibility of enhancing Photo Ads through the exhibition of various photos in a single advertisement which the users can scroll through by moving their finger. It also includes a Call to Action button in order to help you increase web traffic and your online sales. Given that it is one of the companies of Facebook, Instagram for Business puts a lot of powerful promotional tools into advertiser’s hands which offer the advertising platform of Facebook. Among these is the possibility to purchase and publish certain advertisements through the same self-management platform. In order to use said self-management platform, it’s necessary that campaigns fulfill a Performance objective, which can be deriving traffic to a website through clicks on a link, promoting the installation of a mobile application or promoting the replay of a video. Meanwhile, the objectives linked to generating brand awareness or recognition are related to the publication of featured photos or videos in users’ newsfeed. These advertisements require an insertion order and work through a commercial systems managed by companies such as Kickads.com. The communicative success stories reached through this Social Network are numerous, as it shown on the Instagram for Business page. Here it encourages advertisers to “Inspire People Visually With Your Business’s Story”. “Cointreau had a goal: we wanted to generate brand awareness and notoriety with content oriented to promote a life style. The Instagram Video Ads allowed us to reach our goals of visibility before a qualified target audience during a key moment in the year”. Learn more details about this Company by clicking here. “Instagram was the best channel for reaching our audience consisting of millennials (people who became adults during the change of the millennium) through our diverse offer to their normal routine. Through relevant and creative content, we developed notoriety and credibility for our brand”. Learn more about this company by clicking here. “Our target audience in Indonesia speak visually, which led to Instagram being the ideal place for finding and inspiring them. 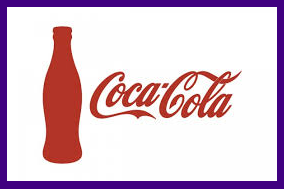 We learned that a combination of high quality cinematography and photography helped us reach the message association that we were looking for with Coca Cola, friendship and happiness”. Get to know more about this company by clicking here. That’s all for today! As you may have noticed, Instagram for Business is ever more important in terms of Digital Marketing and that’s why I hope I’ve informed you on how you can take advantage of this service through this post. Tell me about it later! 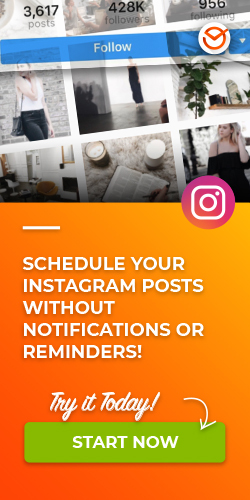 To know more about Instagram and how you can utilize this Social Network to promote your business, I advise taking a glance at our posts The Ultimate Guide to Using Hashtags and Interview with Jenn Herman: “Miss Instagram” share the best social media advice for your business.